This is how the cells start secreting the matrix that will one day be enamel. The round cell with the * center is the leading edge of our ripple. I'll call it a "spark". As the spark goes out (towards the right, arrow), it activates the cells to the right of it. Those cells are just sitting there, ready to go. Once the cells are activated by the passing of the spark, they start secreting matrix. They secrete matrix all together, and do it one layer at a time (the little cubes below the cells). 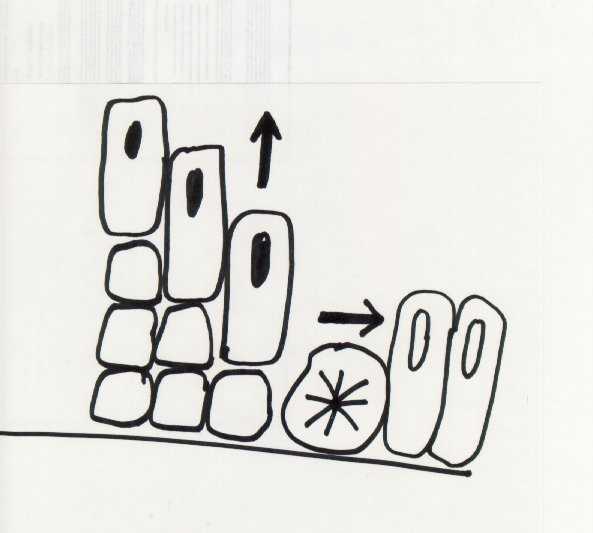 At every cycle, 2 things happen: The spark moves out one cell to the right, activating it, and the whole mass of cells behind the spark (all the activated cells) secrete one cube and move up one notch. Ref: To really learn this growth process, see Schour I, JADA 1940; 27:1778 (part 1) and 1918 (part 2). The "spark" is not visible. It would be at about cell 8 in Schour's Fig. 9, page 1793.